The Tat Lo resort and footbridge, as viewed from the Tad Hang waterfall, just 100m upstream. 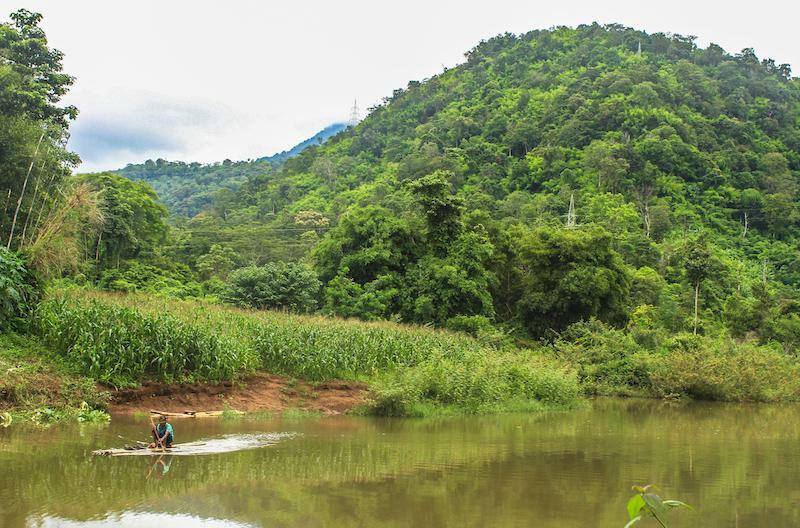 If you love nature and you’re travelling in Southern Laos, then you should definitely consider stopping off in the tranquil riverside nature retreat of Tad Lo for a few nights. 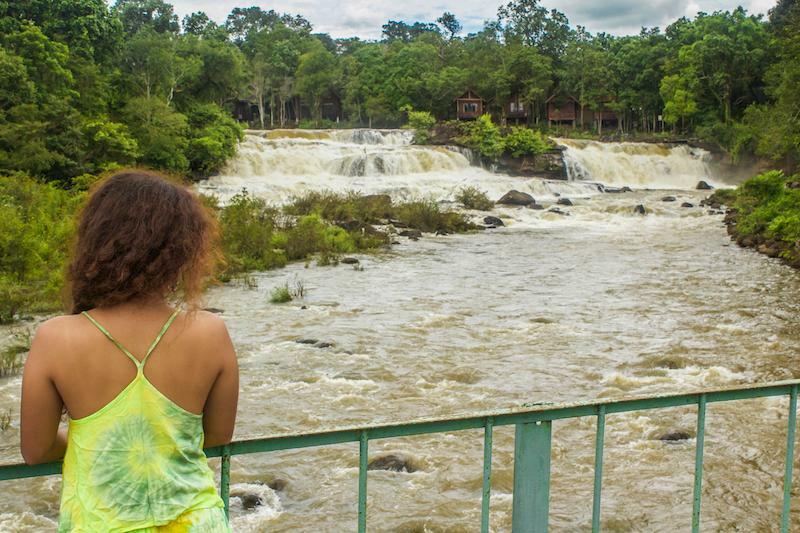 This laid-back nature resort is a veritable gem of a destination that lies off the well-beaten tourist trail in Laos. It’s a kind of backpacker’s retreat with very few backpackers. 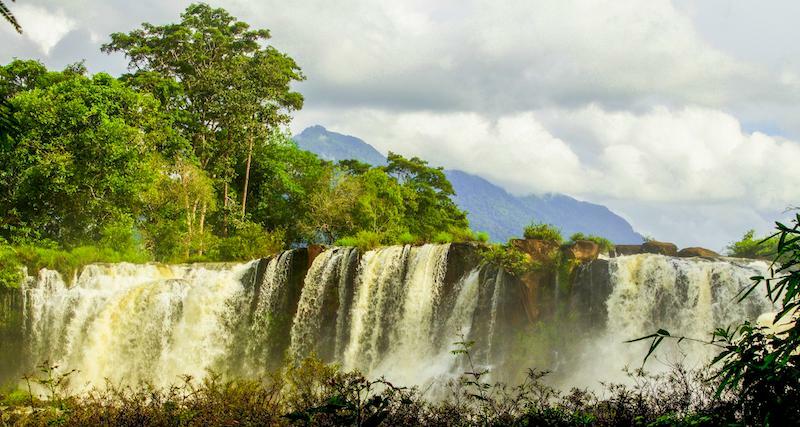 The place is nothing short of a paradise for travellers that love dramatic waterfalls, pristine jungles teeming with wildlife, minority ethnic villages and hammock lounging in beautiful natural surroundings, whiling away the days drinking fruit shakes and coconut water. 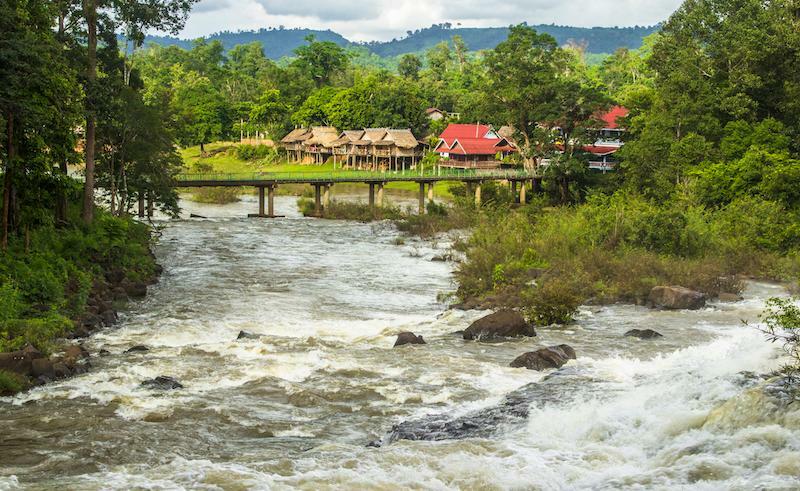 The little cluster of homes, guesthouses, bamboo huts and restaurants that comprise the Tad Lo village retreat straddle the Xe Set river in Salavan Province at a location that is 82km northeast of the town of Pakse and 30km southwest of the town of Salavan. 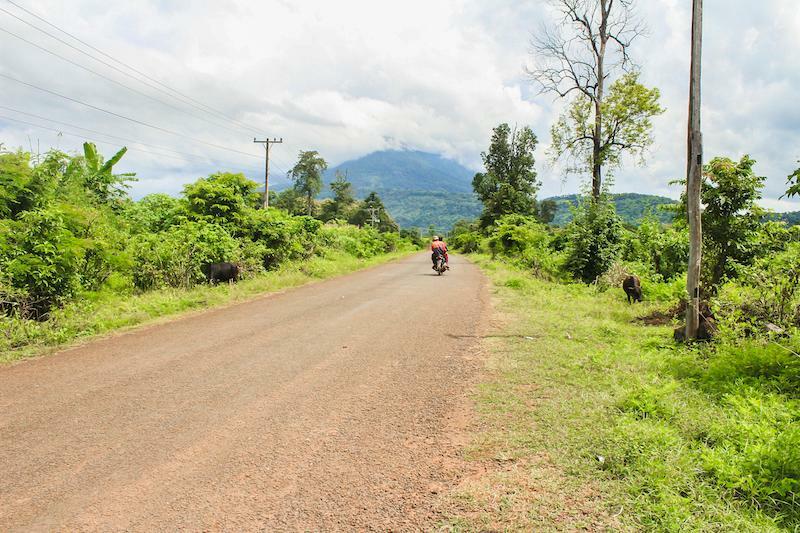 Take the bus from Pakse to Salavan and ask to be dropped off at Tad Lo. The bus should drop you off just after it crosses the Tad Lo river and from here the Tad Lo retreat lies about 1.5km to the south. Just take the right turn about 70 metres beyond the bridge and this will lead you to the resort. As regards travelling the last 1.5km, you can walk, hitchhike or possibly hire a tuk-tuk from where the bus drops you off. The village of Tat Lo or Ban Saen Vang (if you want to call it by its real name) falls within the Tat Lo waterfall park, a 100ha precinct that straddles the banks of the Xe Set river. Most of the homes, guesthouses, restaurants and other facilities that comprise the village are clustered together on the east side of the river, near a footbridge that allows you to cross over to the less developed west side. Some guesthouses and restaurants are built right on the eastern river bank, overlooking the river. 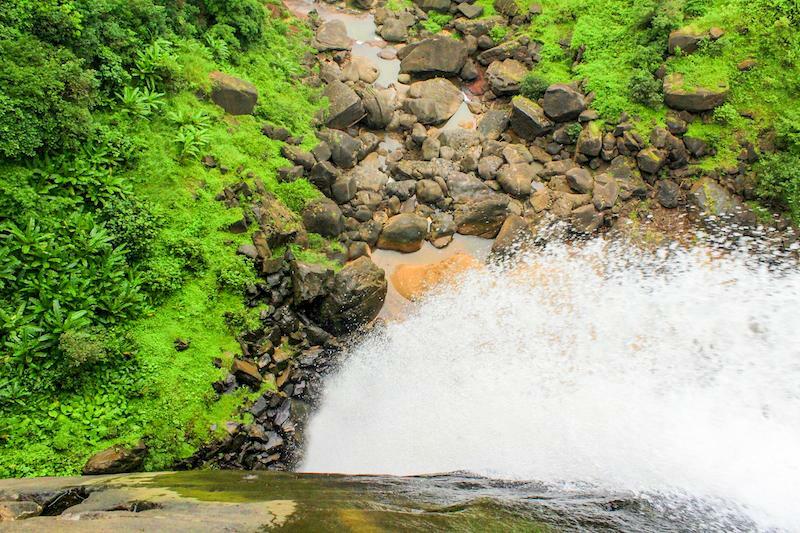 Just a hundred metres or so upstream from the footbridge, you can view the first waterfall, known as Tad Hang. Two more waterfalls, Tad Lo and Tad Soung lie further upstream. 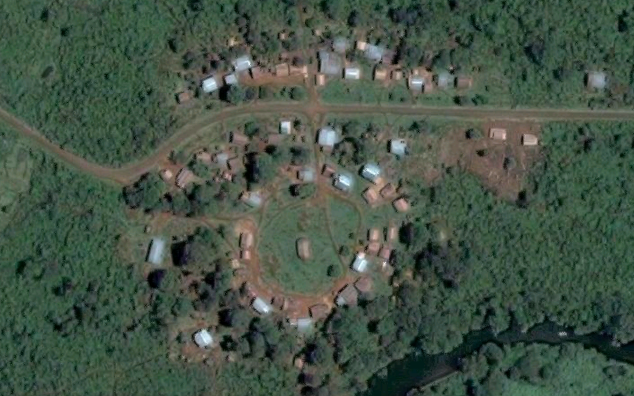 Ethnic minority villages are scattered around Tad Lo (as shown on the map) and can be reached on foot or by motorcycle. There are loads of accommodation options in Tad Lo, most of them on the east side of the river. Some of the guesthouses overlooking the river provide hammocks for lounging in. We stayed in the bamboo huts in 'Tim's Guesthouse', which were pleasant, although we did not find Tim himself to be very forthcoming. There are also several cheap ‘homestays’ that offer dormitory type rooms with mattresses on the floor with mosquito nets. (e.g Mama's Homestay). Many travellers like to stay in Sailomyen Guesthouse on the riverbank, where they can lounge in hammocks and enjoy the views of the river. Now for the most interesting part of this guide; what you can actually do and experience here in the wonderful Tat Lo retreat. 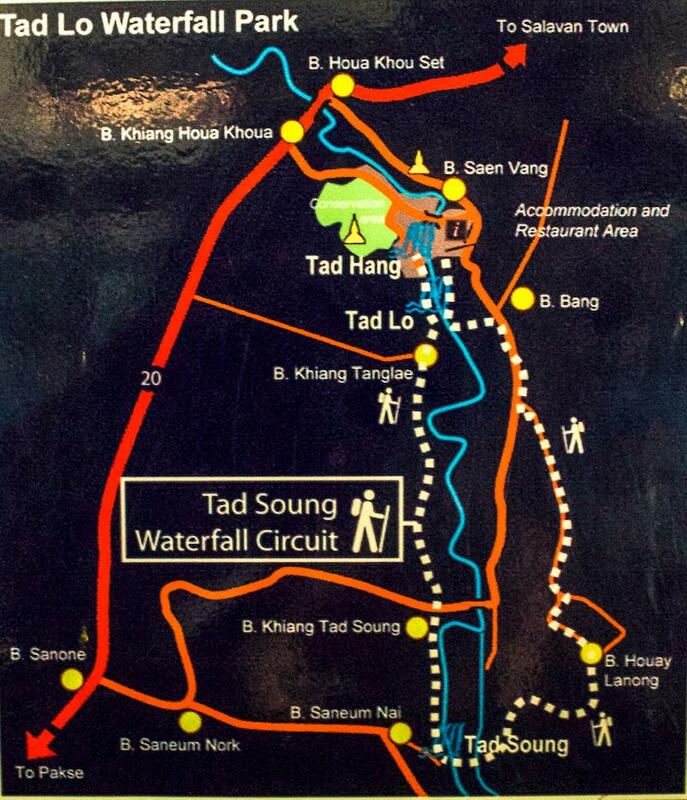 As we mentioned before, there are 3 waterfalls in the vicinity of the village; Tad Hang, Tad Lo and Tad Soung. Each waterfall is higher and more magnificent the previous one as you move upstream. 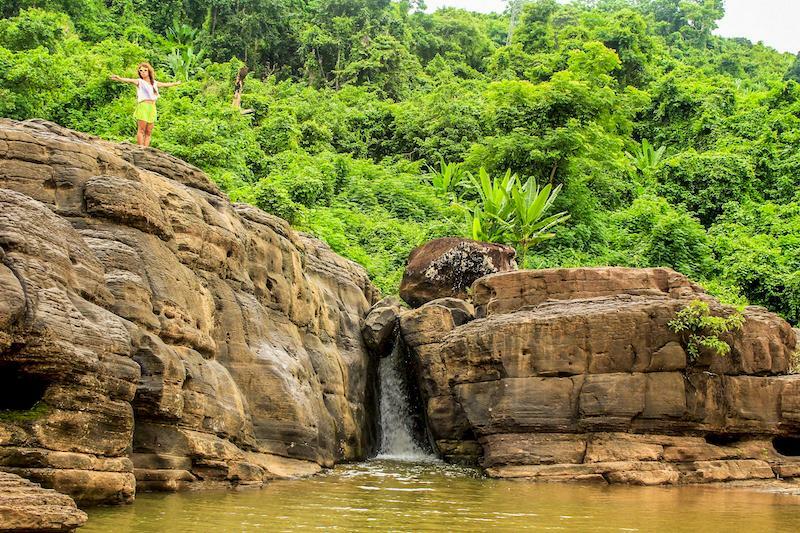 Tad Hang is the closest waterfall, located just 100m upstream of the footbridge that spans the river. The footbridge itself isn’t a bad viewpoint for the waterfall. It’s not a very high waterfall, perhaps only about 10 metres or so in this regard, but it spans the full width of the river and the water volume is impressive in the wet season (we visited in the wet season). 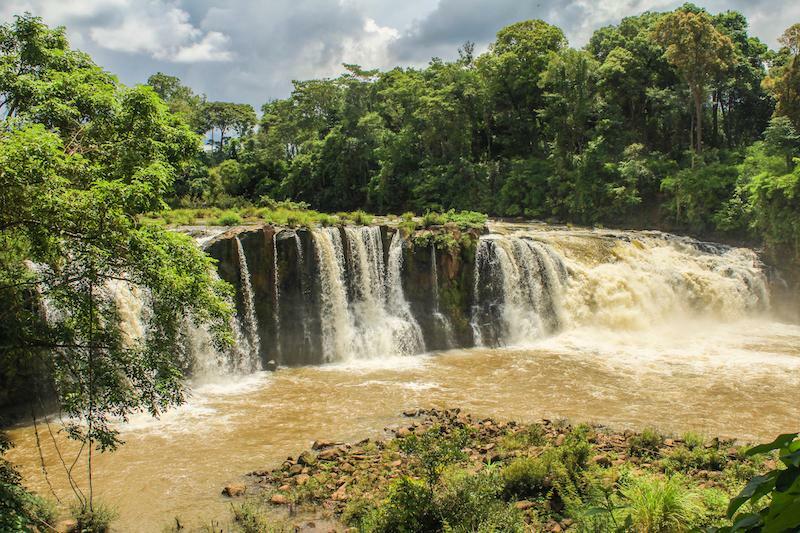 During the dry season, dam authorities upstream may release water in the evening time, so make sure you’re not standing at the top of the waterfall at the time when the water is released. Ask around to find out the release times. 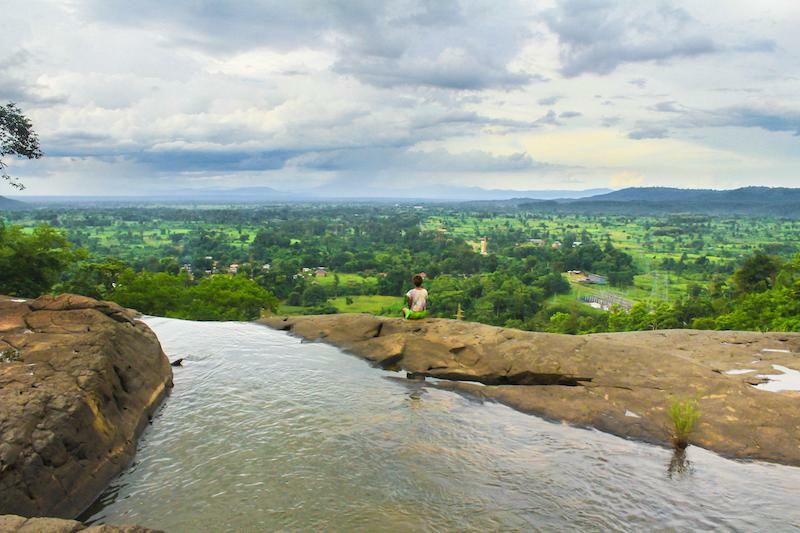 Swimming is only possible at the base of the falls in the dry season. In the wet season, as you can imagine, swimming would be too dangerous in the fast-moving turbulent waters. Local fishermen sometimes cast their nets at the base of the falls and near the footbridge. You’ll notice the waterfall is divided into two channels by a rocky outcrop in the middle. Swallows are known to nest here inside this rock and the waterfall is likely to have been named after these nesting birds since hang means ‘bird’s nest’. 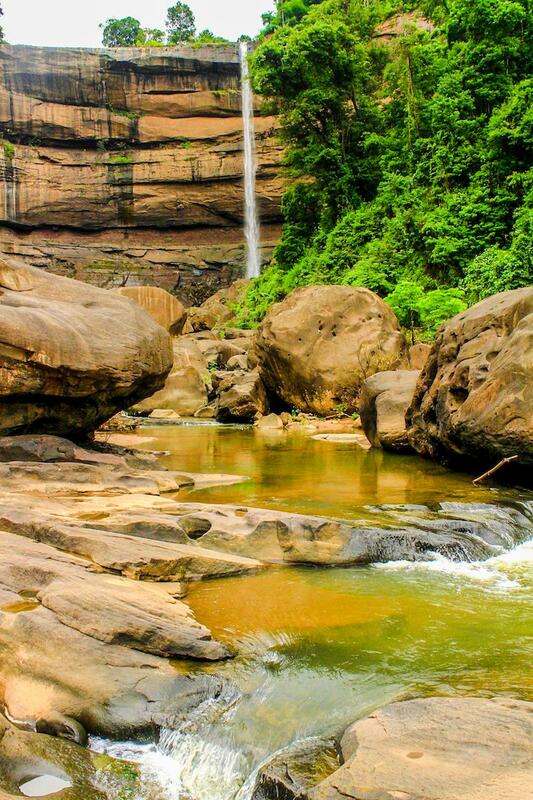 The second waterfall, after which the resort is named, is found just 600 metres upriver of Tad Hang. You can reach it on foot from either side of the river by following the trails that run parallel to the river. 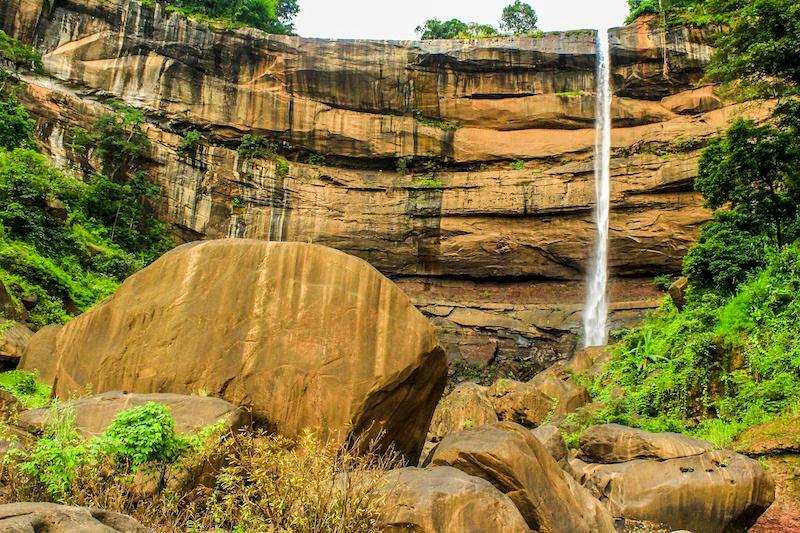 The waterfall is definitely more impressive than Tad Hang, measuring in at about 25 metres in height and spanning the entire width of the river in almost one continuous curtain of falling water. Tat Lo in the wet season, viewed from the east side of the Xe Set river. The waterfall is not as impressive as this in the dry season. You can enter the river at the top of the waterfall on this side also, where local people often like to swim, bathe and wash their clothes. 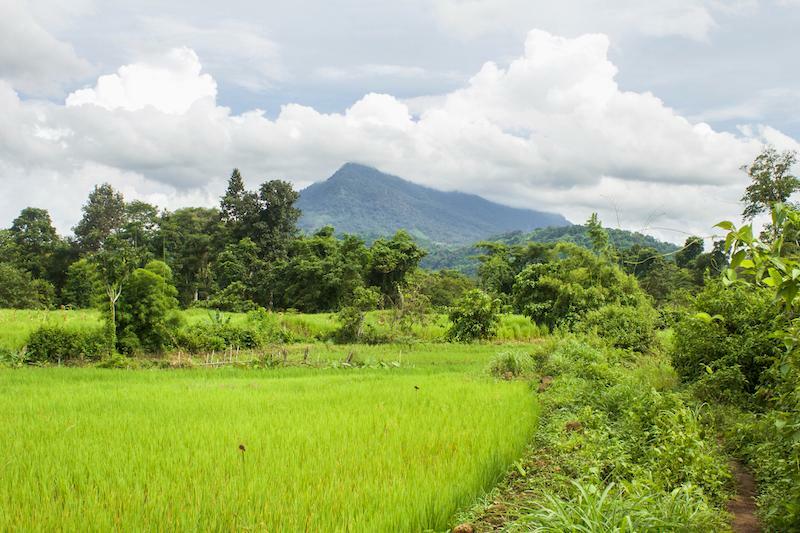 The distant peak in the backdrop is that of Phou Set mountain and it attains a maximum elevation of about 1,500m above sea level. One of the roads leading to Tad Soung waterfall. This waterfall is a little further afield, located about 10km from the village. To reach it your best bet will be to either hitchhike or hire a motorcycle or a tuk-tuk. The name literally means ‘tall waterfall’ and this one is the most impressive of the lot. The water flows over a sheer cliff and plunges over 90 metres to the rocks below. You can either make for the top of the waterfall for fine views of the surrounding landscapes or you can attempt to reach the base of the waterfall. We recommend that you have both experiences because they were both incredibly awesome. The base of the waterfall is very difficult to access because you have to first clamber through a long and convoluted maze of giant boulders that lie in the river bed to get there. 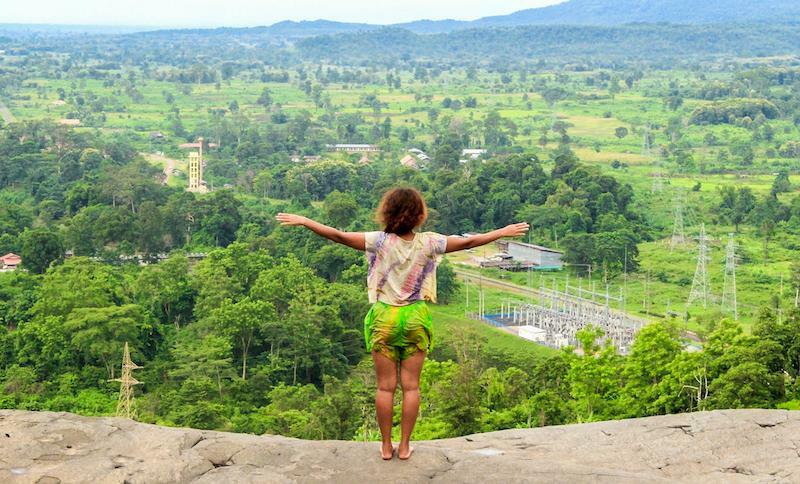 Only truly adventurous travellers will be willing to attempt this in earnest but the less adventurous can still go to the beginning of the boulder-strewn section of the river bed and appreciate the views of the waterfall from a distance. The first step is to reach Ban Khiang Tad Soung village near the foot of the waterfall. This is one of the interesting ethnic villages that we'll talk about in more detail later in the article. From here you just continue along the trail through the forest until it opens up into an area where food crops like corn and chillies are being cultivated. Chili peppers actually originated in Mexico and were first brought to Asia by Portugese navigators during the 16th century. 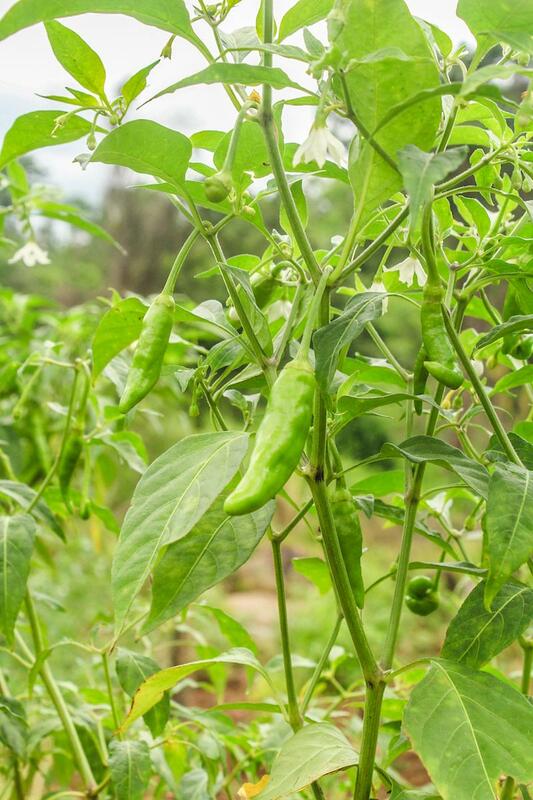 Did you know also that India is the world's largest producer, consumer and exporter of chilies? Then again, that may not come as a big surprise. The people in the hilly regions of Laos practice slash-and-burn agriculture, where in January or February the trees and vegetation are cut down and the slashed material is then left for a month to sun dry before being burned. Fields are usually abandoned after a year or two of cultivation to allow them to lie fallow and a new area of land is then targeted for the slash-and-burn process. When you finally reach the river bed, you'll see that it's almost dried up and strewn with many large rocks and some truly gigantic boulders. The low water volume here is a result of a hydroelectric power station upstream, which has reduced the waterfall and the river to a mere trickle. 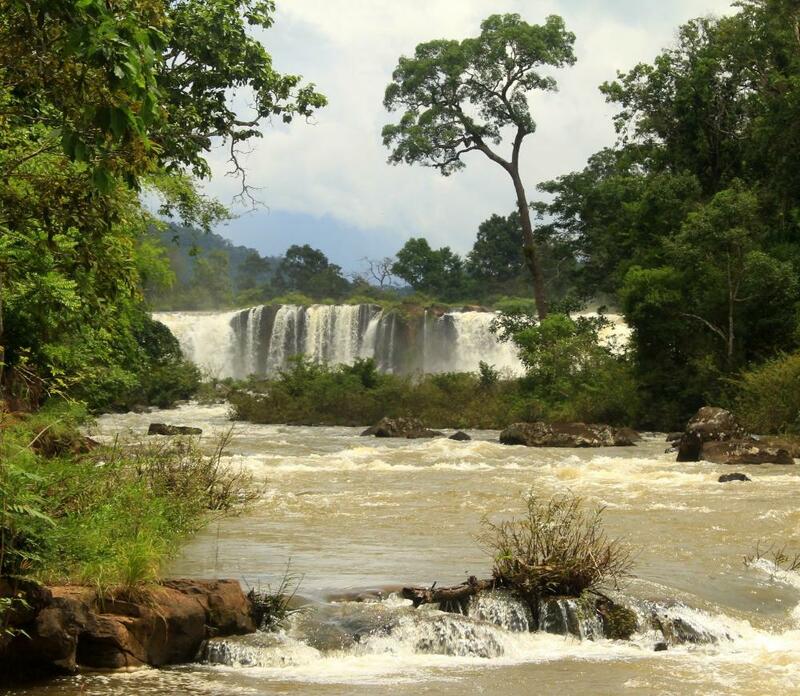 Hydroelectric power is Lao's largest export and the country has built over 38 hydropower plants to date. It currently exports energy to Thailand, Vietnam and Cambodia and Myanmar may be added soon to the list. From here you can either navigate your way upstream to the foot of the waterfall by clambering through the maze of rocks and giant boulders or you can just admire it from a distance. Beware also of the risk of the dam gates being opened and this area getting inundated by a flash flood. Make sure you enquire first about dam release times before you decide to venture to the foot of the waterfall. A section of the riverbed below the waterfall. If coming from the riverbed at the base of the waterfall, there is a trail that goes up along the ridge on the right hand side of the river and eventually brings you to the top of the waterfall. It is quite steep though and passes through dense vegetation. The forested ridge that leads to the top of the waterfall. 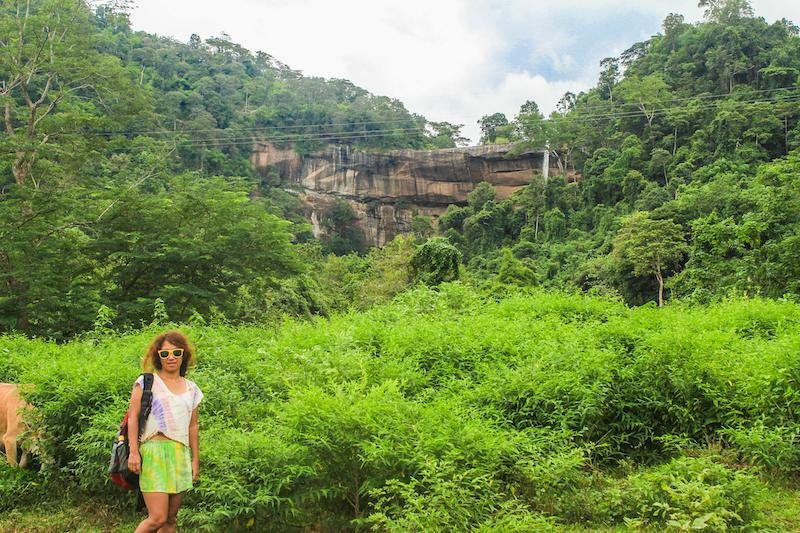 You can also head back to the road that runs by Ban Khiang Tad Soung village and reach the top of the waterfall by following this road. Unfortunately, the road takes a bit of a detour to the west before heading south and then finally east back towards the river, meaning the journey is about 5km in length - further than you might expect. There is another small ethnic village called Ban Saneum Nai above the falls. 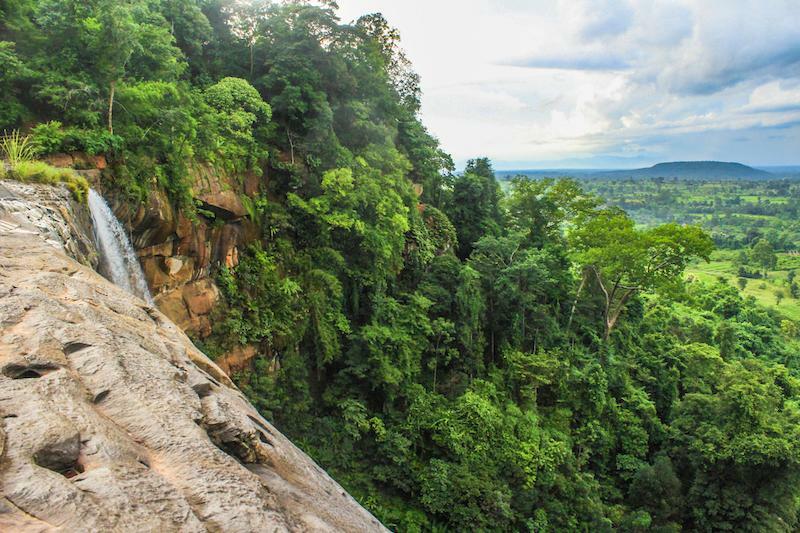 A trail near this village leads you down to the top of the falls where you can experience the incredible views of the Nam Don Plain and the Bolaven escarpment (sloping edge of the Bolaven plateau). Due to the hydroelectric dam upstream, the river has been reduced to a single small channel that flows over the precipice. 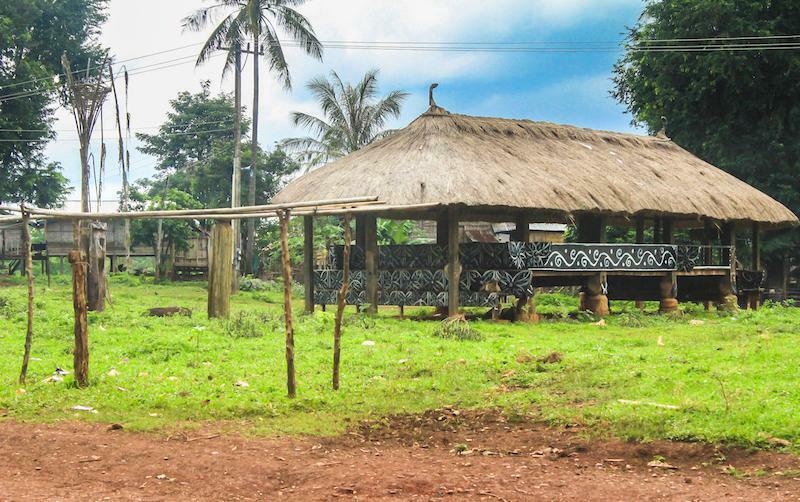 There are a number of different minority ethnic villages in the area around Tat Lo, belonging to groups such as the Tat Oy, the Katu, the Ngae, the Souay and the Nyet. Some villages, such as Ban Khiang Tanglae near Tat Lo waterfall, are home to just one ethnic group (the Ngae in this case) while other villages, such as Ban Khiang Tad Soung, are like small communities comprised of several ethnic groups (the Ngay, Souay and Ta-Oy in this case). The ethnic groups that comprise these villages are greatly outnumbered by and live in much poorer conditions than the majority Lao people. Most of the ethnic groups living around Tad Lo number less than 20,000 throughout the country. The people survive by cultivating various staple food crops such as rice, corn, black beans, winged beans, soybeans, peanuts, sweet potatoes and soybeans as well as some commodities like castor oil seeds (very poisonous), tobacco and even coffee on the higher ground. They also rear various domesticated animals like cows, buffaloes, pigs, chickens, goats and ducks and the diet is also supplemented with small scale hunting (snakes are on the menu), fishing and foraging. 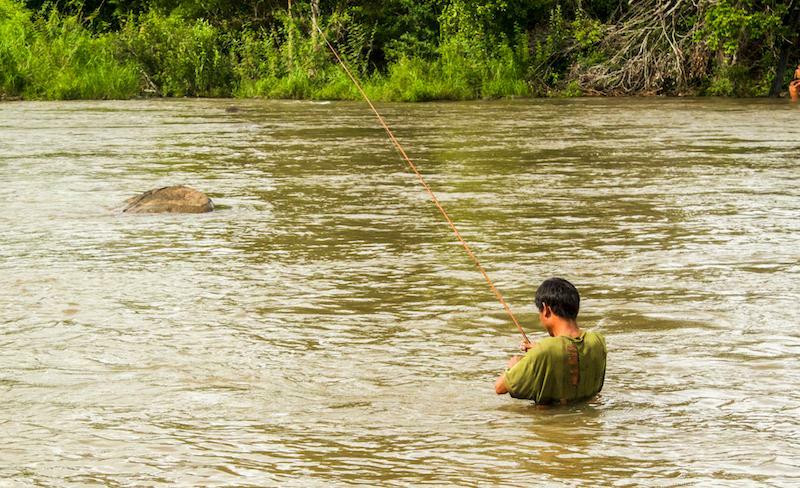 A man attempts to catch lunch in the river near the Ngae village Ban Khiang Tanglae. The villages generally have fairly small populations. For example, Ban Khiang Tanglae has about 270 inhabitants, Ban Khiang Tad Soung about 230 inhabitants and Ban Houay Lanong has almost 400 people. Many homes in the villages don’t have electricity, plumbing or running water, although various organizations are working to better their living conditions. The homes are built from wood, with thatched or corrugated metal roofing and are often raised above the ground on tall wooden stilts. The free space underneath is used mainly for storing firewood, for lounging in hammocks and for keeping domestic animals. Cooking usually takes place over open fires and it is normally the women who chop and gather firewood from the surrounding forests and carry it back to the village in their burden baskets. The different ethnic groups share many similarities in their beliefs and traditions but also many differences. 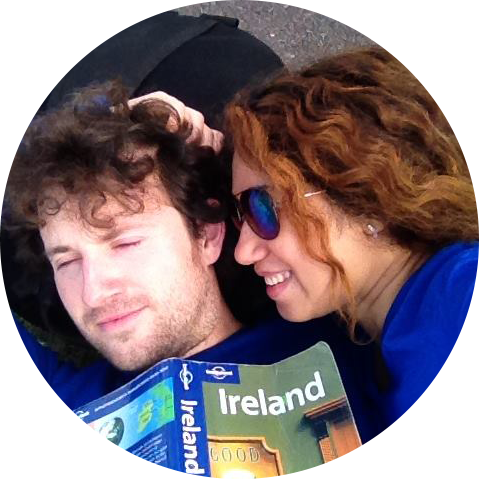 Most of the groups speak different languages even though they may cohabit together in the same village community. Animism or the belief that various objects, living organisms and places have a spirit or a soul, is the predominant belief system among these minority groups. Indeed, animism is believed to be the oldest belief system in the world. Many of them also worship their spirit ancestors and most of the villages around Tad Lo feature a Ho Kuan ceremonial hall or sometimes two halls to serve this purpose. The villages are generally laid out in a circle or quadrangle, with the ceremonial hall often placed in the centre. Aerial view of Ban Khiang Tad Soung. Note the central ceremonial hall surrounded by a ring of houses. The ceremonials hall we saw in Ban Khiang Tad Soung and Ban Khiang Tanglae were semi-open wooden structures with raised floors and thatched roofs. The hall is the focal point for a ceremony that takes place annually in the villages, usually in March, with the exact date depending on the lunar calendar. Ceremonial hall in Ban Khiang Tad Soung. You can see the thick wooden sacrifical post or 'lak ban' outside it. During the ceremony, members of the village dress in traditional clothes, wear masks and carry spears and shields while circumambulating around the ceremonial hall to loud drumming. It all culminates with the sacrifice of a buffalo at the lak ban sacrificial post. The entire purpose of this ceremony is to honour the ancestral spirits, who are likely believed to have influence over the fortunes of those still living. Note that there are many taboos associated with the ceremonial halls. For example, you should never touch the bones, skulls or horns of previously sacrificed animals that you find inside the building (yes you will find them inside). You should also never beat the drum, tie anything to the sacrificial post or damage or hit any part of the ceremonial hall. Some groups have interesting or quirky traditions. 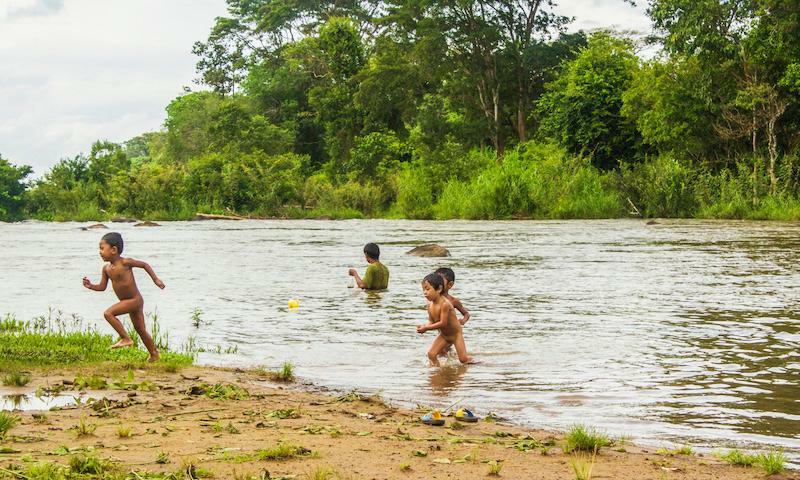 For example, the Katu people smoke a sugarcane-tobacco mixture out of giant bamboo water bongs and not just the adults, the children included. 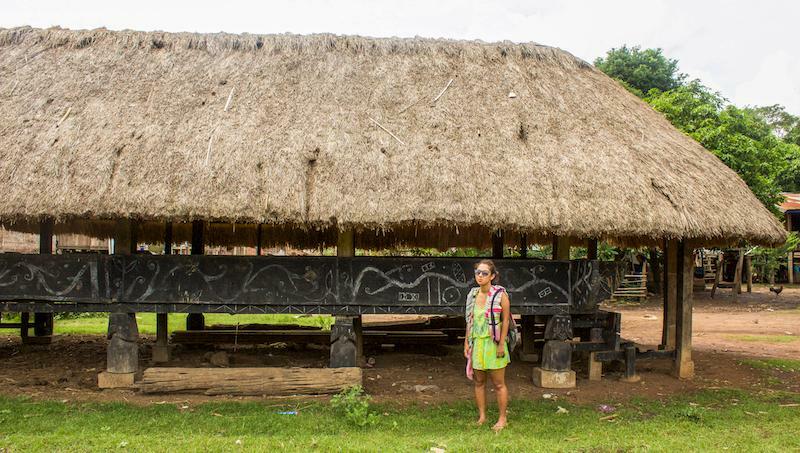 The Katu also start to build their own wooden coffins at the age of 40 and they keep them underneath their homes. Another curiosity you may encounter in some of the villages is a type of liquor called Lao-Khao, which is distilled from sahtoh, a type of rice beer. It’s supposedly a very potent liquor. How wild and free these children are. One thing about these villages is that the children always seem to be very happy and free. Many of the children from the villages attend local schools where they speak strictly Lao. It seems that pens are a scarce resource in these villages because whenever foreigners visit, the kids will often beg them for a pen. It’s probably no harm to hand one over and certainly better than handing out sweets or money. Then again, one could also argue that handing over anything to children fosters in them the habit of begging from those that are more well off, which is never a good thing. Kids in Ban Khiang Tanglae. Some of the ethnic villages are easy enough to get to by yourself. For example we passed through Ban Khiang Tad Soung on our journey to the foot of Tad Soung waterfall and we accidentally stumbled across Ban Khiang Tanglae just upstream from the Tad Lo waterfall. See the map we provided at the beginning of the article for the locations of many of the ethnic villages. It’s also possible to do a guided tour of several ethnic villages with a proper guide, who can also explain the traditions, beliefs and various aspects of the groups’ cultures and lifestyles in more detail. Doing it this way, you may also get to see villages that you wouldn’t have been able to find yourself and have unique experiences that could only be arranged through the guides. Of course the only drawback will be the price. You can negotiate prices in the tourist information centre next to Sabai Sabai guesthouse. Expect to pay around $20 per person for a full day of seeing waterfalls and visiting ethnic villages. 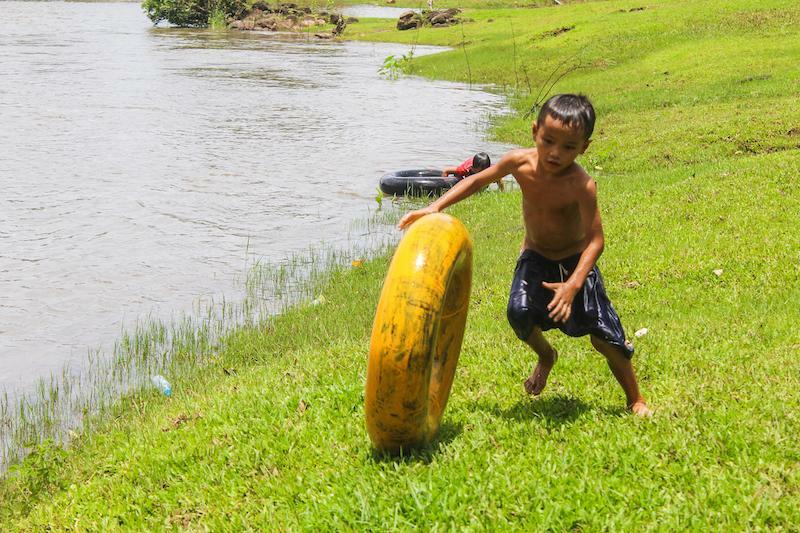 For a fun way to pass the time in Tat Lo, you can try tubing, which involves floating lazily down the river inside a tractor tyre inner tube. You could also attempt the more turbulent waters below the Tad Hang waterfall if you’re there in the wet season but be careful because there are rocks and other hazards. Unlike in Van Vieng further north, where renting a tube for the day comes at a considerable cost due to the high demand, you can hire a tube for the day in Tat Lo for just a few thousand kip. The tubes can be hired from one or two of the guesthouses right on the riverbank. We hired ours from the Sailomyen Guesthouse. 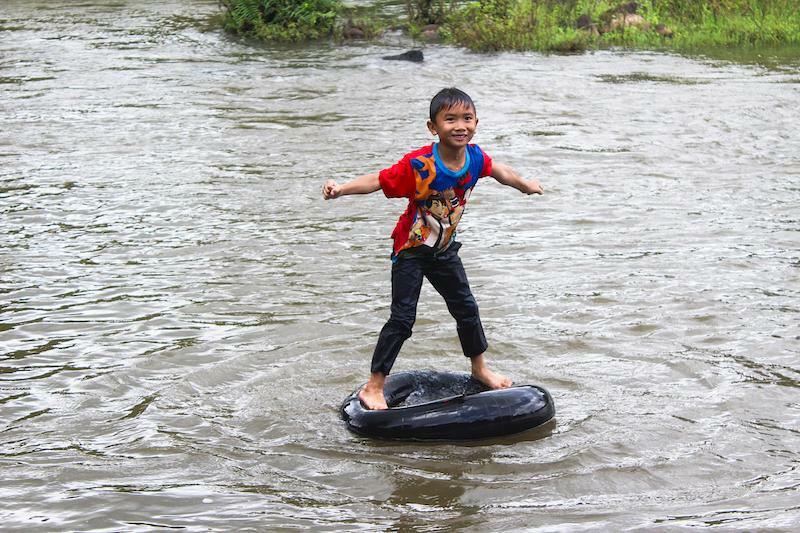 The local kids also enjoy playing in the river on the tubes. 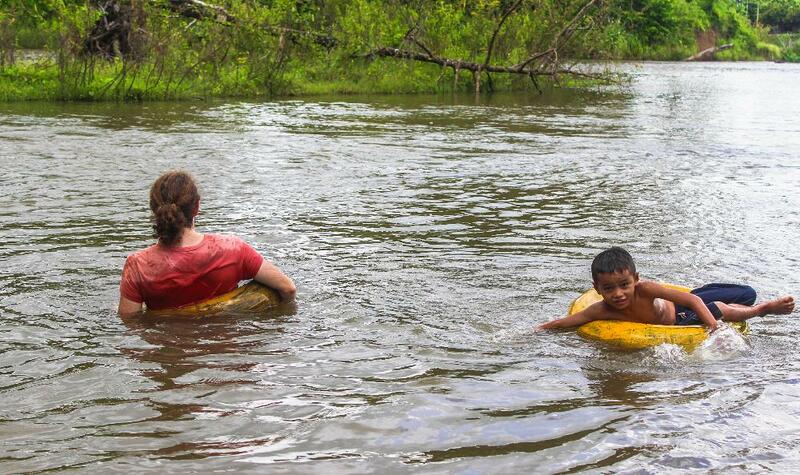 If you’re in doubt as to where to enter the water, maybe the local kids will show you. One enjoyable route is to start on the upstream side of the bridge in the placid backwaters on the Tat Lo side of the river, break into the river current and then float downstream passing underneath the bridge. Wow, amazing balance right there. 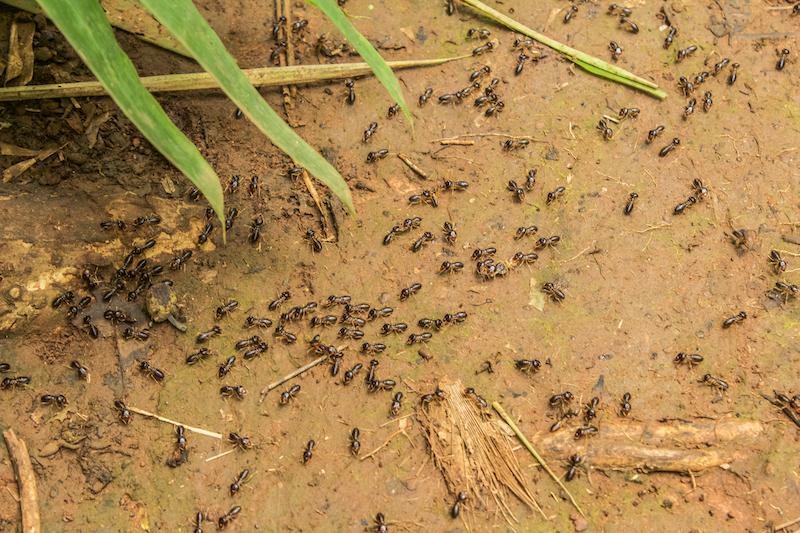 The land around Tat Lo is not all forested, with much of it having been cleared for growing crops like rice, corn, sugarcane, peanuts, soybeans etc. or commodities like tobacco, coffee and castor oil seeds. Paddy fields just outside Ban Khiang Tanglae village. However, along certain stretches, the Xe Set river is lined with lush jungle forest that is teeming with endless natural delights and exotic wildlife. 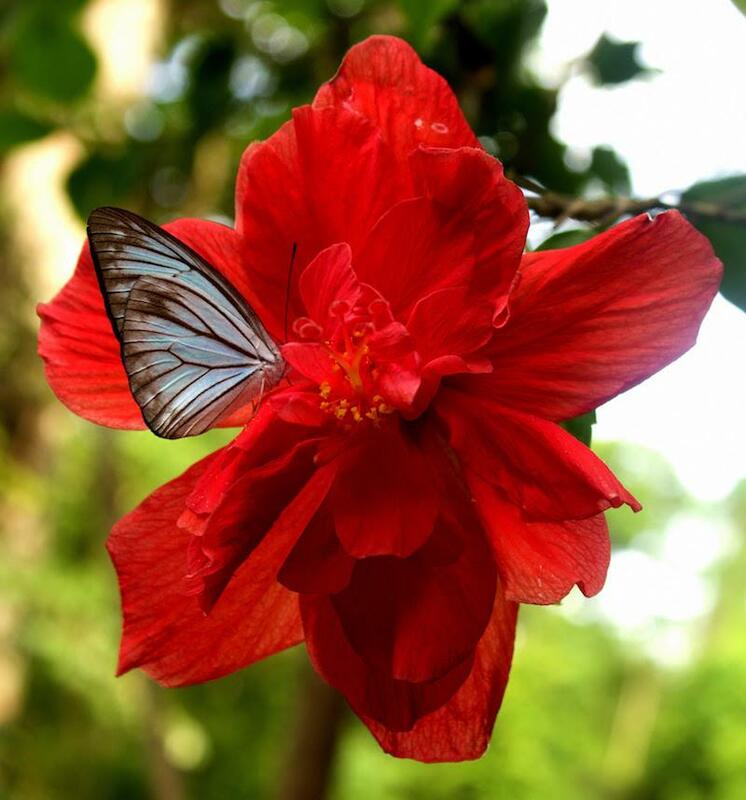 There are beautiful wildflower and orchid blossoms, colourful butterflies, dragonflies, damselflies, tropical birds, snakes and many other creatures. 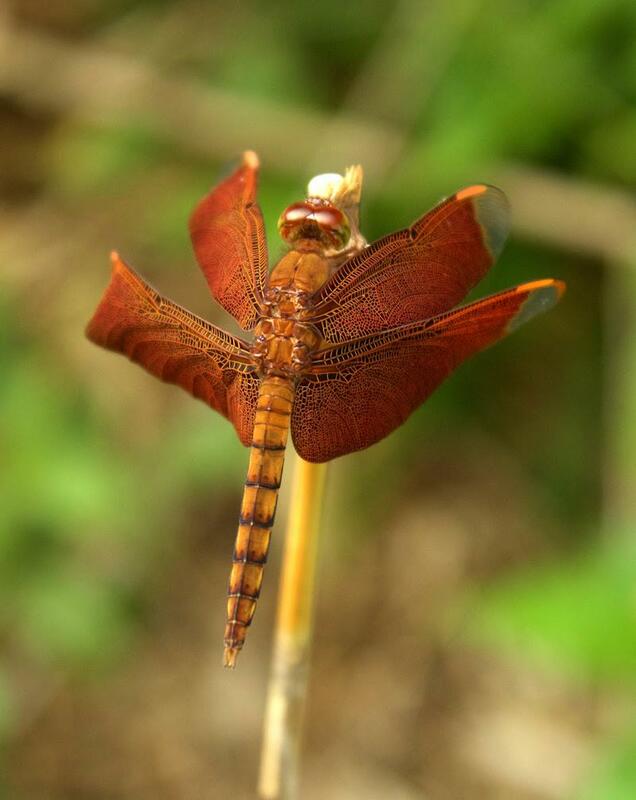 One of our coolest finds was this fulvous forest skimmer dragonfly (Neurothemis fulvia), found in several Asian countries. This one we reckon is a female because the males are usually more reddish in colour. We found it in the jungle by the river, just upstream from the Tat Lo waterfall. Damselflies were also a common sight, usually found perching on boulders or rocks in the river. You can often stalk very close to them with the camera if you don’t make any sudden movements. Dragonflies and damselflies both come from the same order (odonata), but there are many important differences between them. The main differences are in the eyes, wings, body and resting posture. Eyes: Dragonflies tend to have much larger eyes than damselflies, which occupy most of the head. Usually there is no gap between the eyes whereas in damselflies there always is. 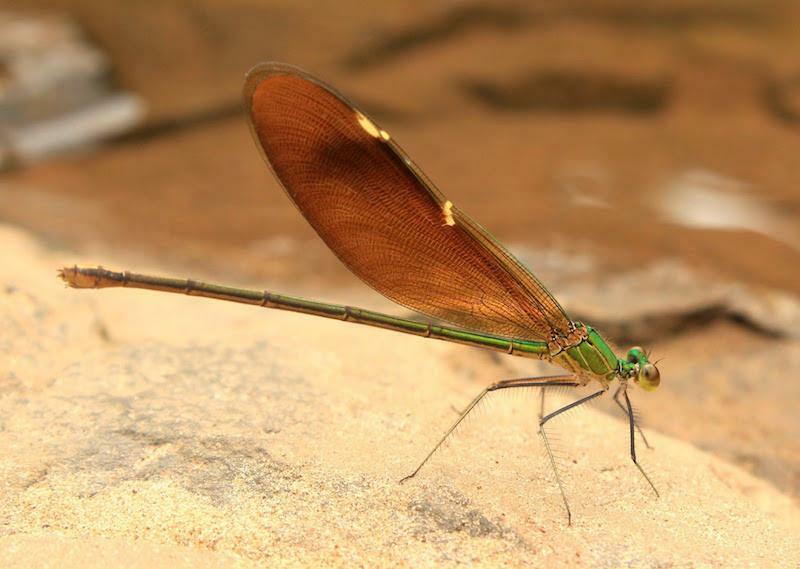 Body: Dragonflies have much more thickset bodies than damselflies. Wings: The hind wings of dragonflies are shaped differently to their forewings with a broader base. 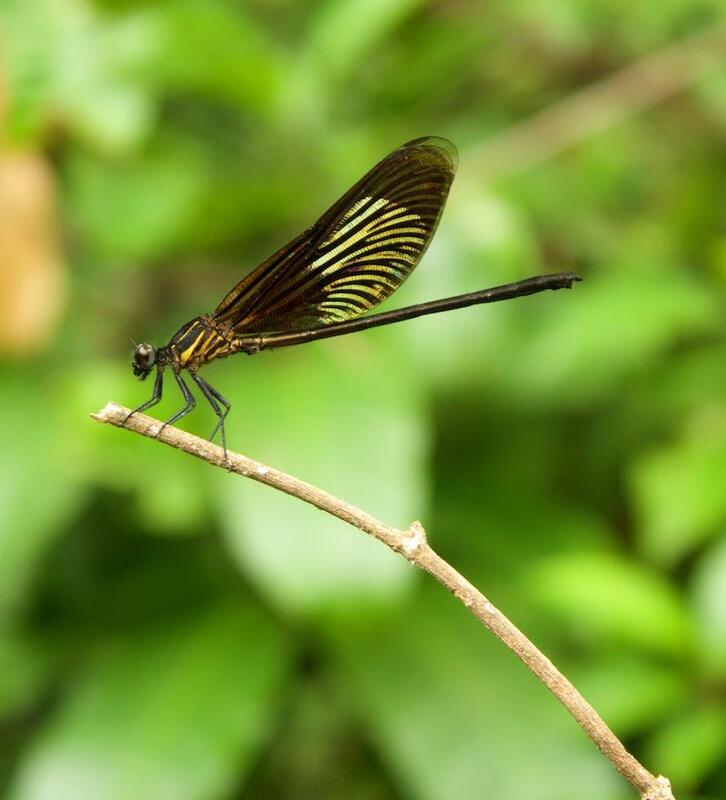 Damselfly forewings and hindwings are the same shape and size and damselfly wings all taper into the body. Resting posture: A final important difference is seen when they're at rest. Dragonflies hold their wings out perpendicular to their bodies whereas damselflies fold their wings and hold them together above the top of their backs. You can see all these differences if you compare the photos above. 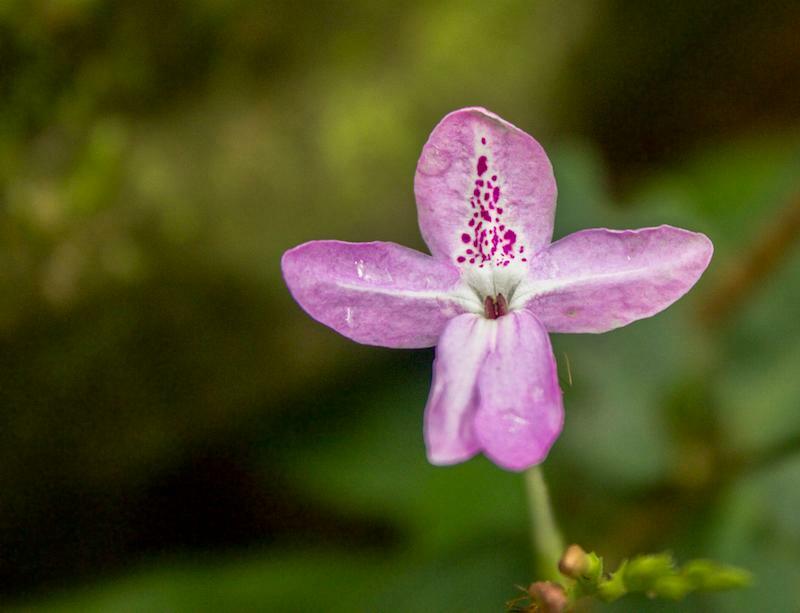 One of the coolest flowers we found during our jungle walks was the one known to the Laos people as the Dara flower. 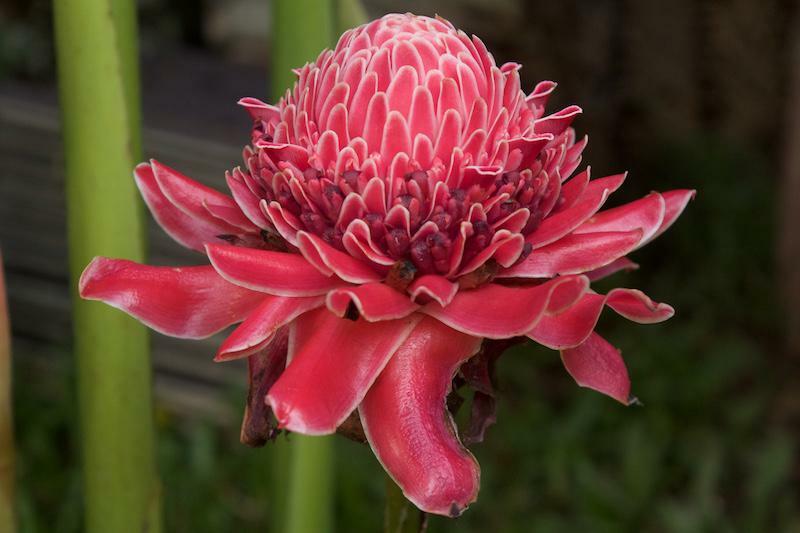 In English the plant is called long ginger or ornamental ginger. We found this outside one of the resorts, not growing wild. Nevertheless, still a beautiful specimen. 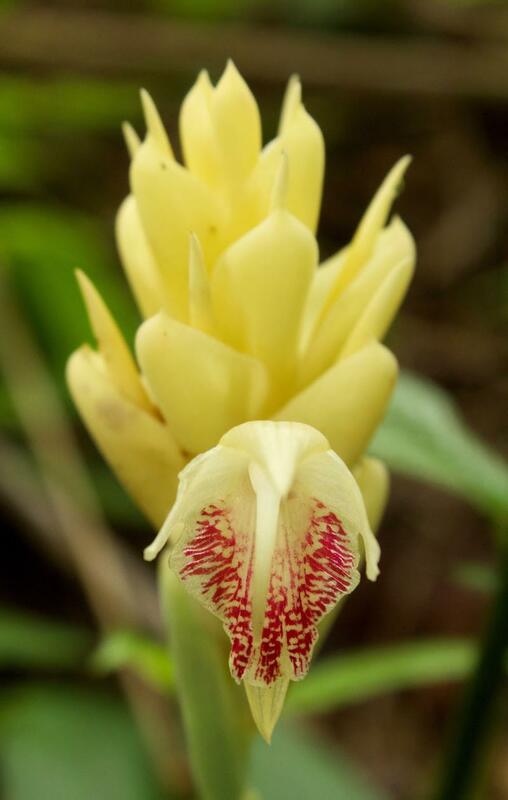 Dara flower, known in English as long ginger or oranamental ginger. 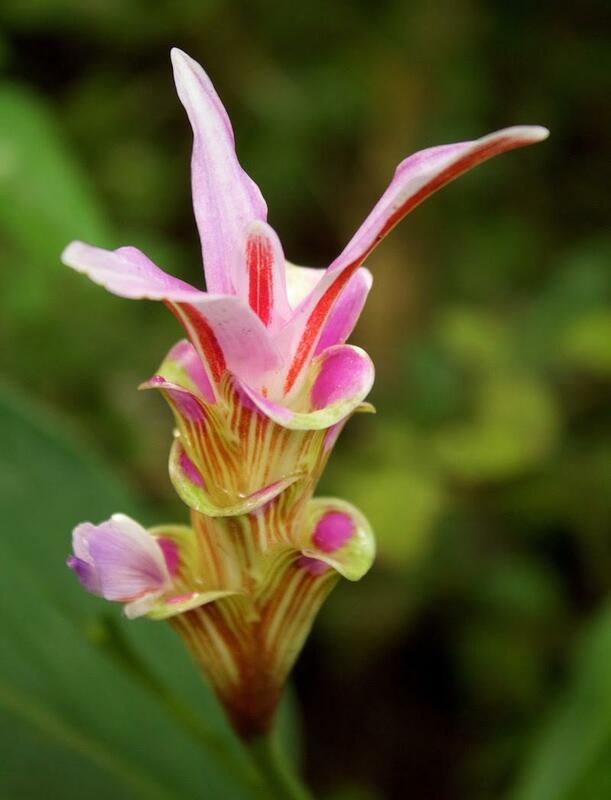 Did you know that the wild ginger plant (Zingiber officinale) is thought to have originated in the tropical rainforests of the Indian subcontinent? 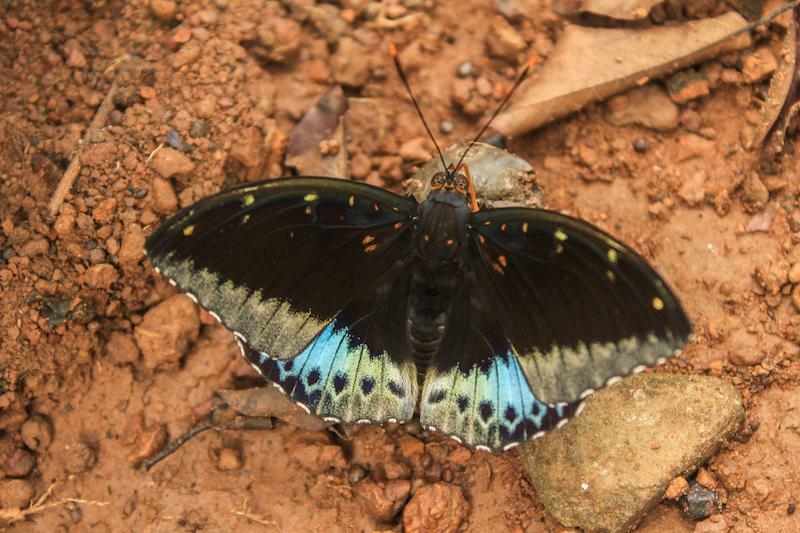 The variety of butterflies fluttering around the jungle was also impressive. The beautiful male common archduke (Lexias pardalis). 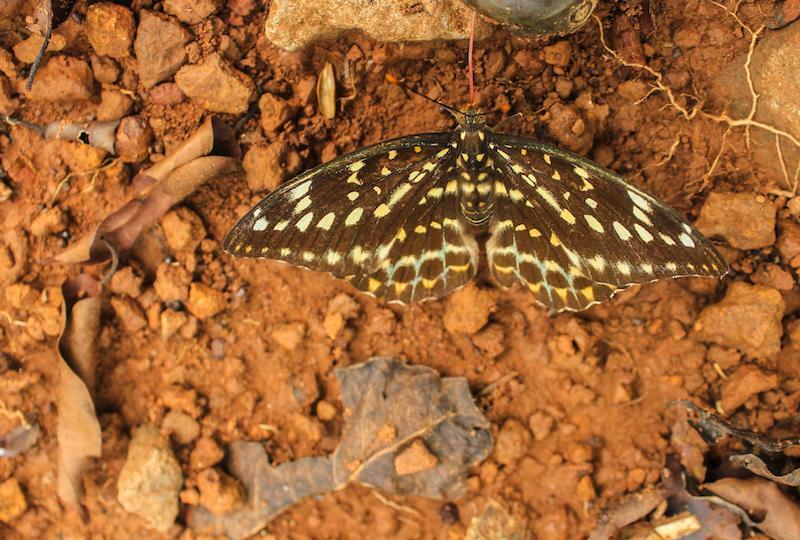 Female common archduke (Lexias pardalis). Note the dramatic difference in the wing pattern and colouration between the male and female. We found also found young Reishi (Ganoderma lucidum) mushrooms. This was a lucky find as the wild Reishi is somewhat rare. 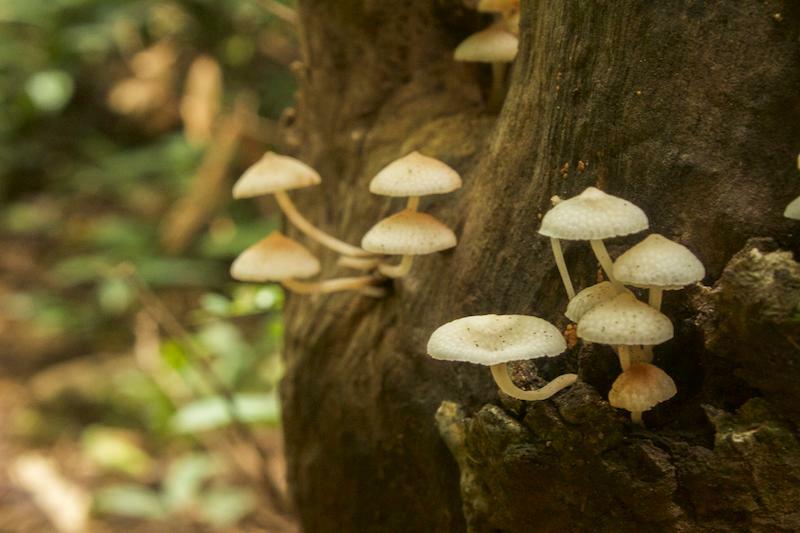 This is an amazingly powerful medicinal mushroom that has been used in Chinese medicine for over 2,000 years. The mushroom can greatly boost the immune system and is also used to treat all kinds of ailments including cancer, asthma, bronchitis, heart disease, high blood pressure, liver disease, kidney disease and many other conditions. 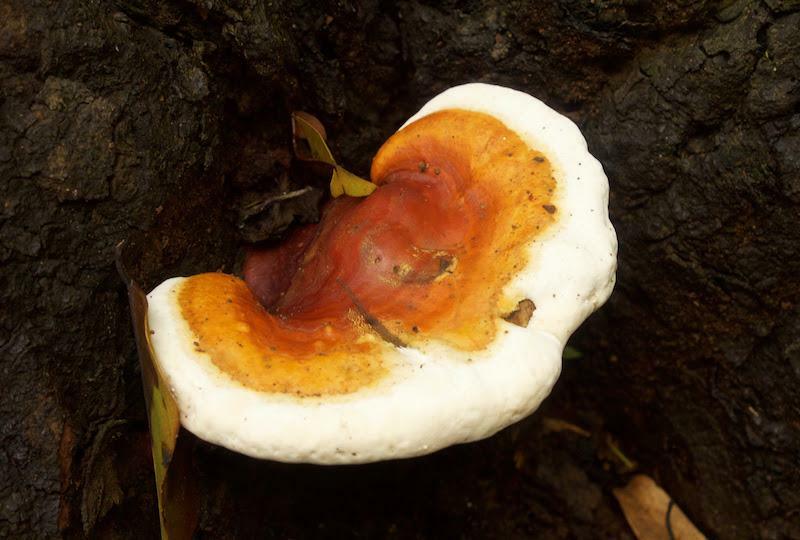 Young Reishi mushroom (Ganoderma Lucidum). Note the varnished red surface, which is often mixed with white and yellow colours in younger specimens. Beware of snakes when you’re walking in the jungle! We came across this slender painted bronze back (Dendralaphis pictus) snake while walking near the river. The species is very mildly venomous but it’s non-aggressive and considered harmless to humans. In fact, many tourists (and some bloggers) often overestimate the proportion of snakes that are venomous in Southeast Asia. In Laos for example, there are about 80 different species of snakes but only about 22 of them could be considered venomous. 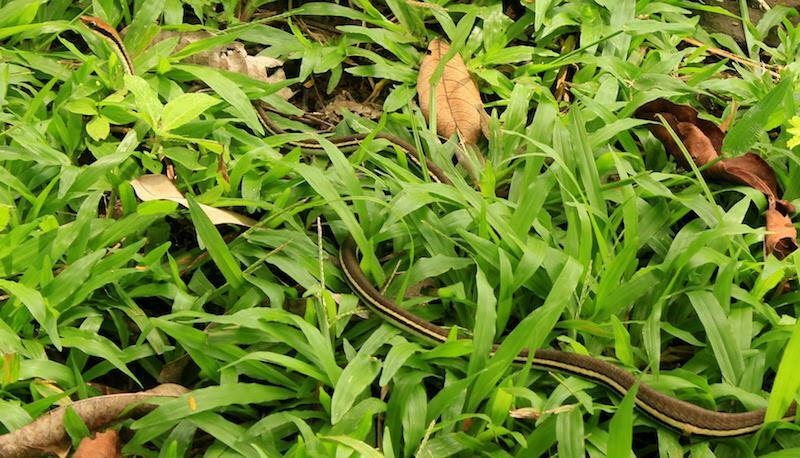 That means that about 72% of snake species in Laos are pretty harmless. Snake encounters are generally pretty rare also. We’ve had less than 10 encounters with snakes after having travelled throughout Asia for over 2 years. People from the ethnic villages around Tat Lo often hunt snakes in the area. They’re either hunting them for food or in some cases it’s possible that they’re targeting the venomous ones to make snake wine, a kind of liquor made by drowning live snakes in alcohol. The bite from their pincers is extremely painful if you walk among them in bare feet or sandals (as we learned the hard way); in fact our screams of pain sent the dog that was accompanying us on our walk running away in a panic! Elephant being rode in the Xe Set river. 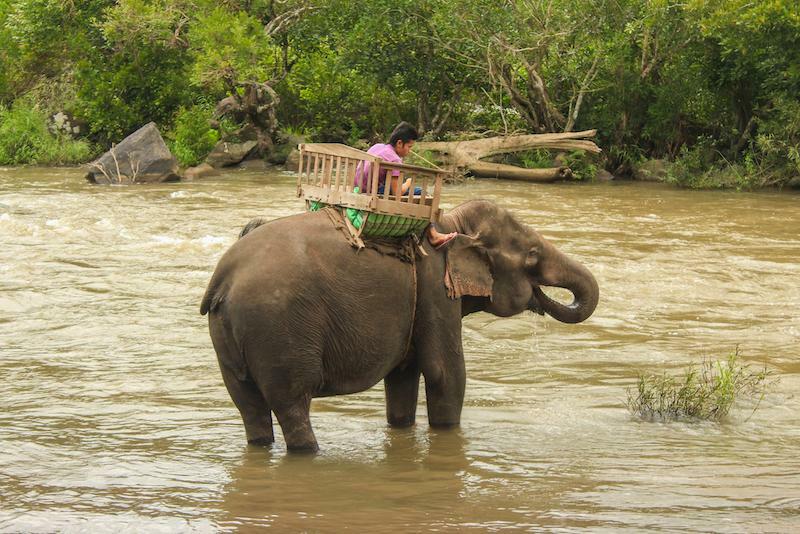 Many guidebooks will tell you that it’s possible to do elephant riding in Tat Lo. This is true but we highly advise against it. The elephants that tourists ride in Southeast Asia have all been subjected to a barbaric procedure called ‘Phajaan’, in which their spirit is broken. After being captured from the wild (often illegally by poachers), the elephant is placed inside a very small constricting cage and is beaten and stabbed with sharp hooks and other instruments as well as being shouted and screamed at and starved of food. Ropes are also tied around the elephants feet and the limbs are stretched. The extreme emotional and physical abuse continues for about 1 month before the future elephant master, the mahout, comes along and ‘saves’ the elephant, bringing it food and water and releasing it from the cage. The mahout is not at all involved in the previous torture and thus a strong bond is thus created between the elephant and mahout and the elephant is now essentially psychologically dependent on or enslaved to the mahout. We visited the Tat Lo Lodge, which offers tourists elephant rides around the village. The owners keep a few elephants at the resort, tethering them to a tree or sturdy post via a chain fitted around the ankle. This is not the life that elephants were meant to lead. Note that the elephant is chained all the time when not in use. 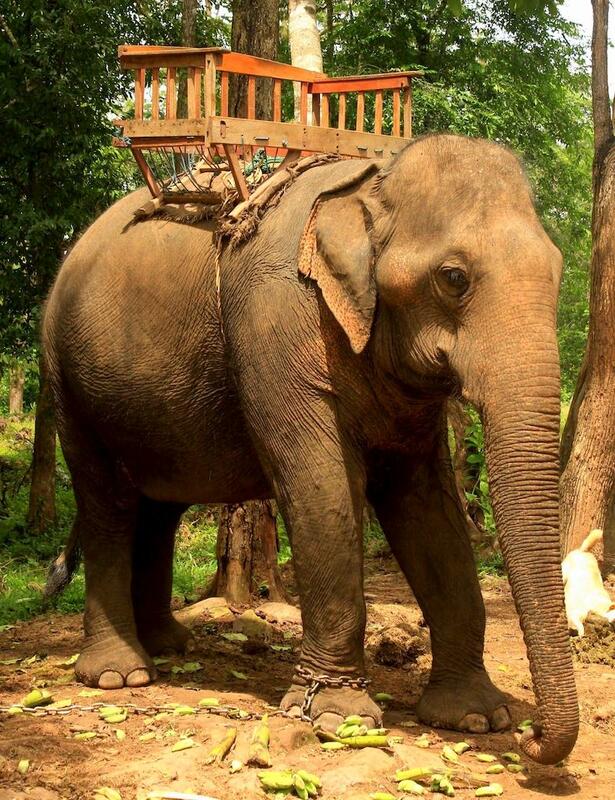 Not only is the spirit breaking process cruel and barbaric, but elephants are also not physically designed to bear large loads on their spines, as they have to do when tourists are sat upon their backs. Elephants can thus suffer long-term back problems and also foot problems from walking on unnatural man-made surfaces like tarmacadam and bearing heavy loads. They also frequently suffer from exhaustion when forced to carry loads of tourists for 8 hours in the hot Asian sun without rest breaks. Bottom line is, don’t ride elephants anywhere in Asia if you don’t want to support this terrible industry. If tourists keep supporting it, elephant slavery will never be eradicated. 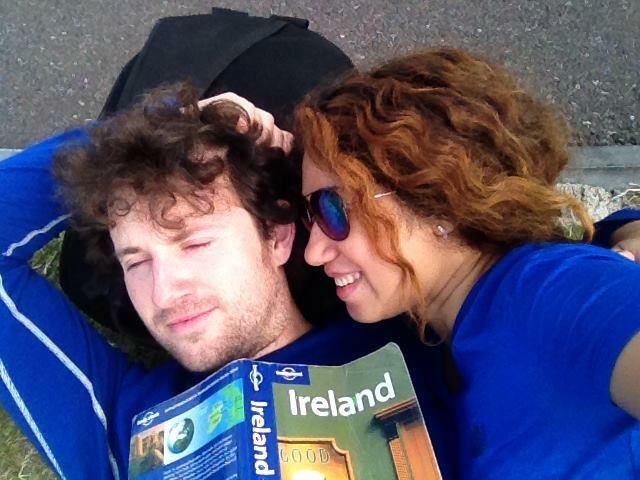 If you found this travel guide useful please share it with other travellers and give us your feedback below. 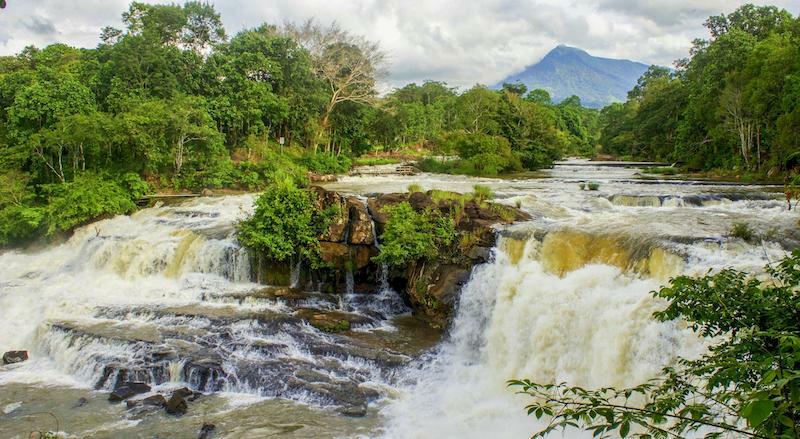 Do you have a favourite off-beat destination in Laos?